Some of you possibly don’t know what the name of our band means. 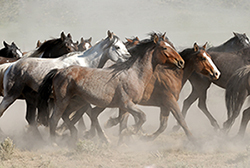 The Brumbies are the wild horses that roam the outback of Australia. In the late 1980’s there was a great movie called “The Man From Snowy River”. It was the true story of Jack Brumby who brought horses to Australia. There is an epic poem written about him. We thought it was great to name our band after a horse; and the Mustangs was already being used. We didn’t know we’d spelled the name wrong until we got a computer and went online to find out about these horses. You can go to the website in Australia where a wonderful lady named Jan Carter takes care of the Brumbies. The destination was Chicago/Evanston, Illinois, it was May 1975. Some old friends were there and had convinced me that in Chicago the music had, “not died” and that I should come on out to their city filled with possibilities. I packed everything that a wandering musician, poet, seeker of truth would need for a cross-country trip into my VW Bug with the California license plate frame that said: “Hollywood” Bob Smith Volkswagen. The possibilities are endless when you’re young, healthy and excited about a new adventure! I knew that a new world awaited me in that far away city! Never mind that I had barely enough money to get there and barely enough sense to know this was an absurd idea. Never mind the “cons” all I could think about were the “pros.” Indeed, in Hollywood the music had died for me and I knew that I had to find some way to bring it back to life for myself. For someone as low on funds as I was to have an Automobile Club Card was a curiosity in itself. But, sometimes I could be practical and I used my card to get free maps and a “Specially” designed route for my trip. It’s amazing to me, now, how well I remember that visit to the Auto Club. I can still see the young lady that helped me at the Hollywood Branch. She pulled out the large map and her amazing, yellow highlighting pen. (this was before they were a common item to us all). We both leaned on the high counter and pondered the maze of lines and discussed my route. I explained that I would be going through 29 Palms to visit my folks, then through Sedona, Arizona to see some friends and on to Denver to sing for a week at a Folk Club there. After Denver I would be going on to Chicago. She highlighted the highways through the first two destinations and then we discussed the shortest route to Denver, which she also highlighted. A few days later I packed these handy maps into my trusty car and hit the trail. Mom and Pops were there in 29 Palms and filled me with hugs and kisses and when I left they filled my car with apricots that I had to throw out when I got to the Arizona State line. Jeanie and Jerry were there in Sedona and also an unexpected old friend from San Diego, Earl Taylor. A few days later I left Sedona and headed North. “A Trek Across The Rocky Mountains”!!! About 4 o’clock that afternoon a snow storm set in; It started out friendly enough, but as I climbed higher and higher above “sea level” I could see less and less of the road in front of me. My windshield wipers had worked fine in California rain, but they were not ready for a Rocky Mountain snow storm. Within a matter of minutes the windshield was entirely covered with ice except for one small inch that followed the struggling wipers across the window on the passenger side of the car! So, that’s how I drove; sitting on the middle hump between the seats, peering out the tiny clearing in the passenger window, barely clinging to the steering wheel from the passenger side, with my left foot barely touching the gas pedal. I do not know how long I drove that way, not even seeing the edge of the road or the surrounding mountains, but I do remember what elation I felt when I saw that glorious sight slowly emerging out of the white wind, a sign that glowed, “MOTEL”!. I had planned to continue on to Denver that day but there was no way you could get me back on that highway; Even I was smart enough to know what I had just been through and what could have happened. The motel owner explained to me that to drive at that high of an altitude you are supposed to have your carburetor re-adjusted. She exclaimed, it was a wonder my car had not stalled on me! Well! I didn’t want to think about that too long–car stalled, no visibility, freezing temperatures, EEK! I could hear the newscaster now; “Young woman crashes in the Rockies, News at 11:00”! Boy, I sure slept good that night. When I opened the motel-room door the next morning, it was so beautiful I could hear the Hallelujah Chorus! As I packed up my car I felt an even greater sense of gratitude for all my good fortune. I headed on down the road to Denver and reached my destination that night with a bad cold in my nose and another good tale tucked underneath my guitar strap. We were called “Rain Cloud Woman”– my sister Linda Lee Shattuck, a good friend Carol Dean Calvert and myself, Jo Ellen Doering. Back then I was Jolene Yester. (T-Bone Burnett started calling me “Jolene” from Dolly Parton’s song by that name) The three of us crazy girls loved to sing and get rowdy and when we got together, we were rowdy! Carol Dean had a cute little apartment in Belmont Shores and I started hangin’ out with her down there by the beach. One night Carol Dean and I went down to the Bodega Bar to hear some music and we ran into my sister Linda Lee. That night in the girls bathroom, for some silly reason, we started singing harmony together and boy was it fun! We decided to create a girls band and we began making our plans for stardom. We started meeting at Carol Dean’s apartment and we’d sing in the kitchen where the echo was real nice. Linda Lee had a voice like liquid Amber, deep and golden; Carol Dean had a strong but sweet voice in spite of her years of singing in Texas honky-tonks and my voice fit real nice between the two of them. There were times in Carol Deans kitchen that we would all start crying ’cause the harmony was so pretty. Girls! I remember one time we all three felt and saw a soft, golden glow fill the room while we were singing. I would find out years later that we were a lot better than I thought we were at the time. Recently I found a cassette of one of our rehearsals and even the rough stuff sounded pretty good. When I told this to my sister Linda she said, “You were always too critical, saying it wasn’t good enough and erasing the cassettes”. Sure wish I had some of those cassettes to listen to right now. Linda had a cool 1972, Red Mustang, 302 Glass Pac, with three speed on the floor. We’d cruise all over the beach in that car. We went around to the local beach clubs and sang at audition/open mic nights and eventually got ourselves a few gigs. We never made much money, but we were just happy to be getting paid for singing. We sang at Mike’s Munchies, The Bodega, The Come Back Inn, and then one night we went over to The Sweetwater in Hermosa Beach to sing at their open mic night. A few days after we sang at The Sweetwater they called and asked if we wanted to play on a week-end, opening for Byron Berline? Did we ever! That started us out on a long relationship with The Sweetwater that continued until just before it was torn down to build a Hilton Resort. For the whole summer of 1976 we had Tuesday nights all to ourselves. Carol used to kid around with the few people (mostly cute young fellas) in the audience saying it was free to get in but it cost $5 bucks to get out. It was at the Sweetwater that we met Vince Gill and The Sweethearts of the Rodeo. Vince was in Byron Berline’s band at the time and whenever Vince was on the road with Byron we would stay at Vince’s house. It was a real nice house and we were two minutes from the Sweetwater. When Vince would come back into town we would pay him back for the phone bill and ask him if he’d come down and play guitar with us. Vince was a good friend to us, so were the guys that owned the Sweetwater; it was a haven, a home. Every other weekend we would be the opening act for whoever was the main act; and on the in between weekends “The Sweethearts”, Janis and Christina, would be the opening act. A couple of years later Janis and Vince got married. But, you know the ending to that story. The Sweetwater was a good place to learn and grow; we could bring out newly learned songs without the harsh glare of Hollywood lights. There in that mild climate and friendly neighborhood of Hermosa Beach we sang our hearts out and dreamed of getting a big job in Hollywood. After awhile we got another regular spot at Houlihan’s Bar on the Redondo Beach Pier. Boy, was that a tough gig. It seemed that every single time we worked there something would go wrong! I’m not kidding! A mic wouldn’t work, or a guitar cord, or a mic cord, Something! It was awful, and we had to haul our amps and equipment up two flights of stairs. But, we were singing and it was invaluable practice. By now we had no money and we’d sold all of our worldly possessions; TV’s, records, books and clothes for any cash we could get. We even sold my trusty VW Bug that had transported me safely across the Rocky Mountains. Linda’s boy-friend Greg bought it and Carol Dean and I took possession, literally, of the Mustang. It was almost a year later that the Mustang caught on fire and burned up by the side of the road. Seemed terribly symbolic at the time, “out in a flash of fire”. At some point another sister, Aggie, got involved with this hair-brained idea and before you knew it we were camped out on her living room floor. She had more than one room, she had two! well, maybe three if you count the bathroom. She also had a real job and she would go off to work in the morning and come home at night and buy us all some cheap wine. Then we’d raid her closet for clothes to wear when we played a job somewhere; and she had great clothes. We drank a lot of Cribari in that apartment, sang a lot of tunes, had a lot of group therapy and many, many laughs. The girls and I also spent a lot of time out in 29 Palms where Mom and Pops had a home they kept while they wandered around the U.S. in their truck and trailer. While we were out there in the desert, we made a few visits to the Pioneer Town Bar. Somehow, Carol Dean and Linda convinced someone that we were a band, and we were hired to play music for a wedding reception. We were going to make some actual money!, I don’t remember how much, but it was enough for us to book a room in Yucca Valley at a motel with a pool! Mind you, this was the desert, it was summer! AND our first gig out of town! That big Sunday we left the motel with our equipment and our make-up and headed down the road to Pioneer Town. When we got to the bend in the road where you could see the old-time buildings, our mouths dropped open! There, in front of the Pioneer Town Bar were no less than 150 motorcycles!! What had we gotten into? This was a biker’s wedding! Were they Hells Angels? Were they just locals? Would the females beat the crap out of us? Back then bikers weren’t doctors and lawyers. Well, we just had to go on in and find out. Boy were we happy to see some people Linda had known when she lived out there a few years before. Well, that was certainly one of the most interesting gigs we ever played; three girls with one acoustic guitar playing Jimmy Buffet and Eagles tunes and anything else we could think of to keep those drunk bikers dancin’! And I’ve got to say, we did it! I also got a fat lip, not from a biker chic hitting me, but from one of them falling over drunk and knocking the microphone into my mouth while she was dancing. I figured I was getting paid back for the time I did the same thing to a Jimmy Discount when I was drunk and danced into his mic while he was singing. We played there many more times and we always got paid real good, which allowed us to get that motel room with the pool. One night when we were on our way back down the hill I was in the back seat, depressed and wondering if it was all supposed to be this hard. Meantime, Carol and Linda were in the front seats having a great ol’ time. Linda was driving and dared Carol Dean to “moon” the next truck. Well, she took the dare and sure enough, the next truck we passed, she rolled down the window, rolled down her pants and mooned the driver! Sure snapped me out of my depression real fast. We laughed for the next two miles. Somewhere during this time we auditioned for The Gong Show. By the time they called us back to be on the show we felt embarrassed to do it; they actually begged us, but we feigned a death in the family. We just couldn’t face doing it, though it would be fun now to say that we had. One day when we still lived with Aggie at the Charlie Chaplin Apts. in Hollywood we got a call to be the opening act at The Roxy on Sunset Blvd. (This was before you had to pay to play there) We were so excited! At the Sweetwater we had opened the show several times for a local DJ named Jimmy Rabbit and he had asked for us to be his opening act. He could barely sing, but knew how to get a good band together and how to entertain the crowd. I loved one of his lines; he’d yell at the audience, “How many of y’all out there have four-by-fours? !”, the crowd would respond with a rowdy yell, then he’d yell back, “How many of ya ever been off the asphalt?!”. So, there we were at The Roxy! We had an actual sound check! Then, the stage manager told us to just wait around and he’d let us know when we were going to start our show. Meantime, Carol Dean and Linda got more and more nervous and had, unbeknownst to me, taken a few pills. I don’t even know what kind of pills, but as our starting time kept getting pushed further and further back, they got more and more nervous. We never did find out why they kept postponing the show time. But, by the time we were told to go on the stage Carol and Linda were both wound up tight as a drum head. ( I guess they’d taken uppers) I must say, though, they still sang like birds and it was pure joy to sing with monitors and a great sound system. We could actually hear ourselves for the first time and we sounded pretty good! A bunch of friends were in the audience that night and they told us we sang real purty. Even the stage manager came back and said he liked what we did. I wish I could say that Rain Cloud Woman went on from there to make more beautiful music, but that was the last time we really sang together. Later that night my sister Linda gave me a clip to the jaw and I knew that was it. We all knew that it wasn’t going to work and we didn’t have whatever it is that makes a group keep going on. That night we became Rained Out Woman. I sure miss singing with those crazy girls. Hey! Shirley Christian and Marc Cohen, wherever you are, thanks for lettin’ us sleep on your floor. Are we having fun yet? What is my name? Where’s my red socks? All of us are now sober and have been for many years. Thank the good Lord we finally wised up! My sister Linda Lee Shattuck passed away on August 5th, 2009. The first time I walked in the door of The Troubadour Folk Music Club in Los Angeles, it was 1963. My girl friend Diane and I had come up from San Diego to go to the UCLA Folk Music Festival. We were big fans of Bob Dylan, John Hammond, Dave VanRonk, Mississippi John Hurt and any music that was folk/blues. One night we borrowed Diane’s sister’s car. We were driving around and were, basically, lost. We saw the sign that said “Doug Westons Troubadour–Folk Music Club” and boy howdy that was for us! 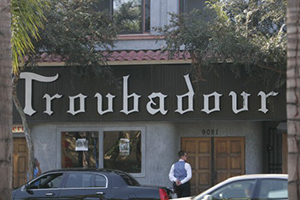 At that time the Troubadour entrance was directly into the main room without a bar or ticket booth out front. When you walked in, the stage was at the opposite end of the room; there were theater seats down the middle and small rows of seats on either side. That night I think we may have been the only people in a room that could have held 200 or more. We sat down in the back and within a few seconds we were spell bound by what we heard on that stage. I mean, we were from San Diego! The music down there was good, but not on the same planet as what we heard that night. It was Taj Mahal and Jesse Lee Kincaid. Taj, of course, was a big, rural looking black guy. (In 63 we still said “colored” instead of black.) If I remember right, he had on Levi overalls. Jesse was a young, dark haired beauty. The two of them singing and playing their own brand of folk/blues was almost more than us two emotionally excitable girls could handle. This was before the two of us, and two other girls, went all over the Orient on a USO Tour and saw the big world all by ourselves. Diane and I also played guitars, but the music those two guys were playing was what we usually heard on albums we bought in record stores. We were downright giddy. With our chattering and swooning in the rear of the room they might have thought we didn’t like what they were doing, but let me tell you, we loved it!! The next time I was at The Troubadour I was fortunate enough to go on the stage. Diane was there too, along with the two girls we went half way around the world with, Carolyn and Pam. We were dressed in our matching outfits of red, white and blue, ready for our USO Tour. Our manager somehow got us on the famous Monday night “Troubadour Hootenanny”, and the name of the USO Tour was, “Hollywood Hootenanny”. (Yikes!). I played banjo and guitar that night and Carolyn also played guitar. When I played the banjo Diane and Pam played the guitars. I can remember being scared out of my wits when I walked on that stage. I was barely in my body. It was a long time before I walked in the door of The Troubadour again, maybe a year or more. Diane and I were back from seeing the world. We had sung for 5,000 people on the Fourth of July at March Air Force Base in Manila, Philippines. I felt a little different from the last time I was there; since then we had been to strange foreign lands. In South Korea we saw thousands of North Korean refugees in cardboard, makeshift shelters, or sleeping in gutters up against the street curbs. This was long before homeless people were a common sight on the streets of the United States. In Viet Nam we watched bullet tracers flying towards our plane in the night and listened to machine gun fire while we were singin’ for the boys; that’ll bring a young girl up real fast. But I still wasn’t anything you could call mature, far from it. But I did seem to have a magnet inside that drew me to where ever good music was being made. That’s still true today, and The Troubadour itself was a huge magnet that drew anyone and everyone that made music or wished they could. About this time at The Troubadour there was a group of young men that were regular performers on the Monday night “Hoot”. They would get together and sing and play songs they all knew. Their group began to grow in size and they became known as “The Men”. How’s that for an original title? A few fellas from this group of “men” got together and decided to form a real band. They called themselves “The Association”. The main guys were old buddies of mine from San Diego. They were all talented fellows who loved to sing. They were very fortunate to have a string of “number one” hit songs on the radio: “Along Comes Mary”, “Cherish”, “Windy”, “Never My Love”; their success trailed off from there, But, they were very successful in the 60’s. The Association had a manager who rented them a large house in East Hollywood. It was there that I met Ruthann Freidman, the girl who wrote “Windy”. She sang and played her song for me and said she wanted The Association to hear it. I encouraged her to play it for them. The rest is history on that song. It made her a lot of money. She was also my Maid of Honor when I married one of the guys in that group, Jim Yester. It was a few more years before I came down to the Troub again. That’s what we called it, the Troub. By then I was divorced from Jim Yester. I was free, again, to follow my own inner compass and it led me right back there to the music and friendship. By now they had remodeled the entire showroom; Instead of theater seats there were now tables and chairs, with benches along the back wall. They put a bar at the entrance and a ticket booth out front. Upstairs where the huge warm-up room used to be, there was now a balcony with long benches, and Doug Weston’s private office. They also created dressing rooms! The stage was on the right side of the room now, facing West and looking up to the balcony. The kitchen served great hamburgers and a colorful guy named Gat ran the kitchen. Gat wore his hair in a long ponytail and had an earring in one of his earlobes. Back then people just didn’t look like that! He looked like a Pirate who just got off of his ship. Larry Murray and Rick Cunha ran the Monday night “Hoots” and once in awhile I would get the courage to go on down and ask if I could do a few tunes. The Troubadour stage is the absolute best for hearing yourself sing and for seeing the entire room. It could also be very intimidating. You could see anyone who entered the room on the left and just wondered on by you to go to the bathroom at the right. The lighting was also excellent, thanks to the creative and flamboyant Michael Shears, who always wore a long black cape. Rick would let you know if you could sing 2 or 3 songs, depending on how many people had signed up that night. A lot of great people would drop by and do a couple of tunes on the “Hoot”; Jackson Browne, Glen Frey, J.D. Souther, a few of the guys who later wrote all The Eagles tunes. More than once a week, but at least on those Monday nights, Rick Cunha would invite us all over to his apartment after the Troub closed. The singing and guitar playing would continue on through the night and sometimes till dawn. In Nashville they call these get togethers a “song pull”. We would all take turns sharing a favorite song or a newly written one; Or Doug Dillard would lead us into one bluegrass song after another. I learned to play pretty good Flat-pickin’ guitar on those nights, tryin’ to keep up with Doug’s blazing banjo. For Rick Cunhas birthday I bought him a five-gallon can of coffee. I wanted to thank him for the bottomless pot of coffee on those wonderful nights filled with music. Running down the middle of Santa Monica Blvd. in front of the Troub there are railroad tracks. Yes, REAL railroad tracks. They’re still there under the lawn. Back then, once in awhile a real train would come by. From inside the bar you could hear the rumble of the train and the whistle would blow to alert any cars at the Doheny Blvd. intersection. Well, that was like a call to arms for all good folk singers! In a flash we would all run out to the tracks and cheer on a few guys who would run and catch the train and hang on for a short ride. The fellas would get a big round of laughter and applause. The way we carried on! But, it wasn’t just the act of jumping on the train, it was because it WAS a train…..You know! A real train, in the city! We were city folk singers who only sang about trains and hobos and here was one we could actually see, touch, jump on and ride! After our big adventure we’d all pile back into the bar and sing a few rounds of “I’ll Fly Away” with Doug Dillard leading us on. Those times felt more like home to me than anywhere I’d ever been. The singing and the harmonies in that corner, gathered around those small, round tables brought a feeling I will never forget. It brought me back to a time when I was a kid and we’d have family music gatherings on Sundays after church. We each left our empty, lonely apartments and wandered on down to the Troub every night for those two to three years of our young lives. Companionship is the most basic reason people around the world gather in bars. This was our living room, our community campfire. Sitting at the bar you could hear conversations ranging from boring and mundane to deep and philosophical. I spent an entire night at that bar sharing deep thoughts with Tom Waits. I also spent a crazy night with Glen Frey teaching me the ritual of Tequila shots, Lime and Salt. In the showroom, the wide steps up to the balcony were my favorite place to stand. Resting my arms and setting a drink on the ledge in front of me, I had the best view in the room. From my “spot” there on the steps I saw a young Willie Nelson, Waylon Jennings, Kris Kristofferson, Elton John, Tim Hardin, Buffalo Springfield, Sir Douglas Quintet, Jackson Browne, War, Longbranch Penny Whistle (Glen Frey & J.D. Souther), Delaney and Bonnie, Ian and Sylvia, Linda Ronstadt, Sammy Kershaw, Bette Midler, The Staple Singers, Judy Henske, Hoyt Axton, Dillard and Clark, Gordon Lightfoot, Rick Cunha, Hearts & Flowers, The Nitty Gritty Dirt Band, Earl Scruggs Family Band, Jim Croce, Steve Martin, Gene Clark, Bernie Leadon; on and on and on! Late one night J.D. Souther and I were sitting downstairs on the back bench when we witnessed Bonnie Raitt’s audition set! Doug Weston would have an unknown act do a short show late on a weeknight. J.D. and I were blown away! We sat there with our mouths open. Here was this fine lookin’ chic, playin’ slide blues guitar and singin’ like a bird! I was sold then and I’ve been a big fan ever since. On another night I walked through to go to the restroom and there was a willowy blonde on stage; her long hair hanging down covering her face, swaying as she moved to her guitar playing. I sat down and listened to Joni Mitchell’s audition set. What a place! What an opportunity! What music I heard there! The Bitter End in Greenwich Village was probably the only other place that could compare to The Troub during that time. On another night I sat in morbid fascination watching Tim Hardin mumble and stumble around the stage in doped up delirium. I was also very fortunate to have had my own name on that marquee. Doug Weston booked me as opening act with a performer that was new to the West Coast; His name was James Taylor and he had a new album called, “Sweet Baby James.” By the middle of the week I had a bad cold and had to sleep between the first and second shows. But, what a week! James Taylor! Did I even know where I was and the road that he was already on? Carol King was his piano player, Russ Kunkel on drums, I think it was Lee Sklar on bass, but I’m not sure. How did I do? I don’t know; Eric Burden from The Animals told me he was impressed that I could play those guitar rhythms and sing at the same time. I got a good review in the L.A. Times. After I played on that stage, from then on I could watch the show without having to buy a ticket. I still feel like that was and is an honor. From then on I was given free passage through those hallowed doors. There is one other honor that was bestowed upon me there. I don’t know about the men’s bathroom, but in the ladies bathroom, the walls were covered with a zillion quotes, statements, proclamations, artwork, poems, and many other expressions of creativity. These were part of the decor and were never disturbed or washed off. One night I went into the ladies room, sat down on the toilet, looked to my left and …. there on the wall…… written in pencil ……. just above the toilet paper roll….was the chorus to one of my songs! !…Who put it there?…It had to be a girl, but…then, it didn’t necessarily….it could have been a guy….during the day….When did she or he hear that song?…I don’t remember singing it on that stage….it had to be someone who knew me……Who?……I never did find out. But those penciled words on that wall are still precious in my memory. To me it was as if they had been written on the marquee out front. I wrote those words for my father who used to play guitar and sing to me when I was a little girl. There are times that I’ll have a dream with The Troub in it and I’ll know that a part of me is feeling like I did back then, which was mostly scared and insecure. Or, I’m trying to re-capture a part of my youth; perhaps I’m feeling old and tired and need a shot of those vibrant memories. Many of the other musicians that came through those doors during that time went on to become world famous. Some of the biggest names in modern music history of the United States were born there. That can provoke interesting thoughts in someone who didn’t travel down the same road of “world fame”. In one line from the song written about The Troubadour, called “The Sad Cafe”, The Eagles wrote: “Why does fate take some, and leave the others to go free?” Am I one of those who was left “free”? That subject is always a good ol’ bone to drag out and chew on once in awhile. The people, the music and art that came through those doors, during that period of the late 1960’s and early 1970’s, is possibly comprobable to the Impressionist Painters movement in France in the late 1800’s; or the creation of Jazz in New Orleans and Chicago in the beginning of the 20th Century. Also, Greenwich Village at that same time was home to many of the musicians that came West to Los Angeles and performed on that stage at The Troubadour. The Troub was a fertile breeding ground for more than just music, ideas and friendship. A lot of lies also flourished there. Lies like: love was free, without attachments; women were equal, that drugs and alcohol were harmless, that blacks were equal and that we all had no hang-ups. The birth of popular music as a huge business commodity was also born there. For a very long time playing music would have that underlying feeling of it being worth something that could be bought or sold; and if someone didn’t buy it the feeling of failure would creep in. I feel very blessed to have been at The Troubadour during those incredible years, and it would take many years before I was able to just sit, again, in someone’s living room and share a few tunes, or sing just for the sheer joy of it. It would also take a lot of years and therapy to find the initial impulse that brought me there in the first place. I’m very pleased to say that my connection to that impulse is strong and clear again and has been, now, for quite awhile. The Troub has a life of its own in my fertile sub-conscious; it’s one of several important cornerstones around which other events have gathered and formed the structures of my life. The Troub was and still is a foundation from which I grew and continue to grow today.